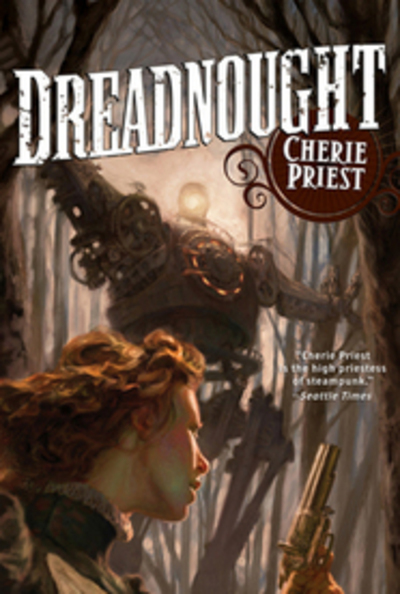 In my opinion, Scott Westerfeld is the king of steampunk, and Cherie Priest is the queen. While Westerfeld is quite light and fun, Priest is dark, with strong horror elements (her zombies are truly awful). Her stories are really dieselpunk (which fits under the steampunk umbrella, but tends to have diesel engines, zeppelins, etc). This is the second book, after Boneshaker, which I haven’t read (zombies are too scary for me, and I think Boneshaker focuses on them a lot more). It certainly stands alone, although toward the end I could tell I’d missed some things (the main character was catching up at the same time as I was, but I do now know exactly what happens in Boneshaker). Dreadnought is set in the American civil war. Priest acknowledges that she’s messed up history for her own purposes, but it’s clear she was motivated by creativity rather than ignorance. This is a lady who knows her stuff. She writes very, very well and I knew from page one that I was under her considerable power. If you can handle blood and gore and zombies, READ THIS. Rating: MA for blood and gore and zombies. Down in the laundry room with the bloody-wet floors and the ceiling-high stacks of sheets, wraps, and blankets, Vinita Lynch was elbows-deep in a vat full of dirty pillowcases because she’d promised – she’d sworn on her mother’s life – that she’d find a certain windup pocket watch belonging to Private Hugh Morton before the device was plunged into a tub of simmering soapy water and surely destroyed for good.